With the Route 926 bridge closing for replacement on Feb. 13, Pocopson officials are moving to get residents prepared and ease as many traffic concerns as possible. POCOPSON – The Pocopson township meeting adjourned after only an hour but much was approved by all three supervisors in attendance. 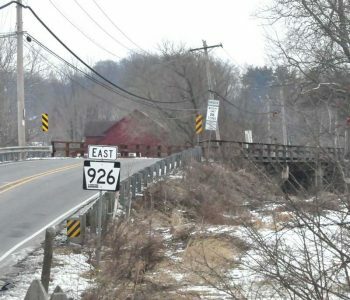 The anticipated Route 926 (Street Road) bridge closure will be a standing agenda item over the next six and a half months with the closure to begin on Feb. 13. The $8.6 million project to replace the 1937 bridge (rehabbed in 1974) is expected to be accelerated and completed by Sept. 1, by Clearwater Construction, Inc. In anticipation of the closure and increased travel, a permanent traffic signal at the intersection of Route 52 (Lenape Road) and Pocopson Road will become active by the end of January – the first week in February. The new signal is the first of its kind in the Philadelphia region and will include a flashing yellow arrow for left turns onto Pocopson Road and West Creek Road. The board approved the hiring of Birmingham Police, contingent upon the availability and signed contract, to be a presence at the intersection for the first three days that the traffic light becomes active and the first three days of the bridge closure. Supervisor Alice Balsama felt the police presence at $65 an hour from 6-9 a.m. and 4-7 p.m. would help with the new transition for motorists. Supervisor Elaine DiMonte will discuss with PennDot the feasibility of adding a flashing sign warning motorists of a red light ahead when travelling northbound. A concerned resident, Matthew Murphy, mentioned heavy vehicles need enough warning to brake and stop on the long decline leading up to the traffic signal. In addition, to deter traffic on the narrow and curvy Denton Hollow Road, signs that state “No Thru Traffic” were approved and will be posted. For up-to-date information on the bridge closure and a visual guide for the new traffic light, please reference Transportation Management Association of Chester County’s website at www.pa926.com. The board of supervisors joined five other neighboring municipalities (Pennsbury, Newlin, Kennett, East Marlborough and Kennett Borough) in accepting a regional system for Emergency Medical Service (EMS) for Longwood, Kennett and Po-Mar-Lin Fire Companies. The report provides a regional and uniform approach. Each municipality would share the costs based on a funding formula – taking into consideration population- and agree to a three-year term. Supervisor Ricki Stumpo presented the 200 plus page report that addresses the financial and service concerns that “will create an authority to manage the system and have a representative on the board for each fire company, an elected director, and part-time paid administrator and secretary. It will run the business of the regional EMS budget, equipment, training needs, and billing. Each fire company will manage their own internal affairs and the board will establish a funding formula going forward,” said Stumpo. The board of supervisors agreed to accept the report as an indication to continue the process. There will be no implementation until a commission is in place. Stumpo reported that this next step will take place in February. In other township news, DiMonte reported that the Barnard House feasibility study is moving forward with six completed tours from architects and three more scheduled. Lots of feedback was provided and a proposal by each firm will be submitted and due by Feb. 20. “I’m very interested to see what they come back with,” said DiMonte, referring to the feasibility of the township offices to occupy a portion of the Barnard House. The site tours also included the Denton Hollow building. The supervisors will select the firm to conduct official feasibility study and report the results to the Chester County Commissioners for action.